San Francisco is a beacon for the west. A beacon of culture, architecture, and natural beauty. I doubt very seriously if city planners from days of yore imagined people flocking to the city to photograph its existence. But here we are, we come in droves to experience the magic of the city by the bay. Millions of tourists from all over the world, come day by day to soak up all the city has to offer, which is a lot. But by night a different city emerges. One that cannot be fully seen by the naked eye. One that requires a camera, a tripod, and time. 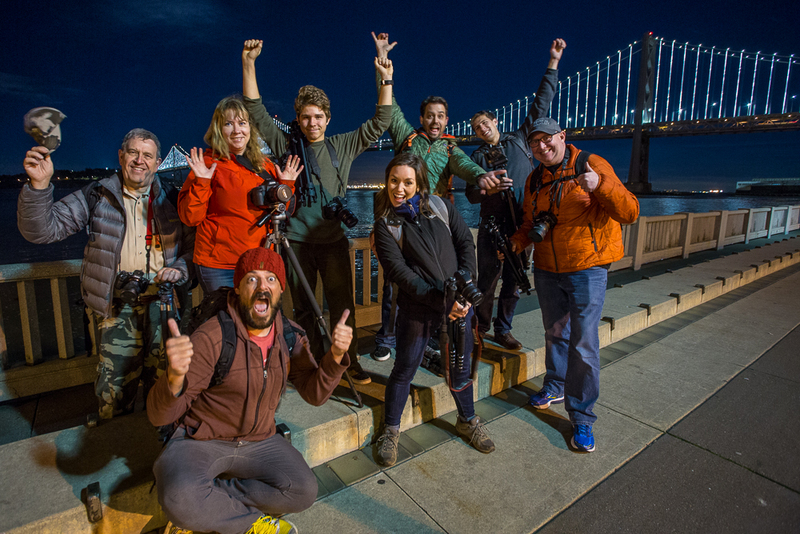 Every month we at the Aperture Academy venture out to San Francisco with a group of photographers from all walks, who also wish to soak up the city, and we call ourselves, The Night Owls. 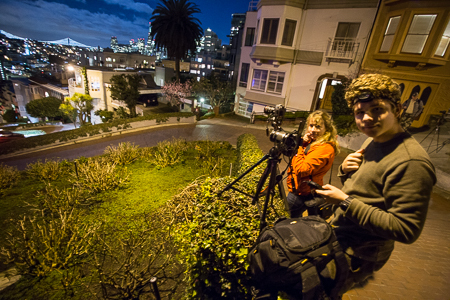 Fellow photographer and instructor Aron Cooperman joined me on this journey through the city streets and we both helped to enlighten our group of the mysteries of night photography in The City. Our first stop of the evening was the Palace of Fine Arts. There is no grander structure in all of San Francisco than the Palace (in my opinion, of course). Its greco-roman and corinthian influences can be seen in every facade. 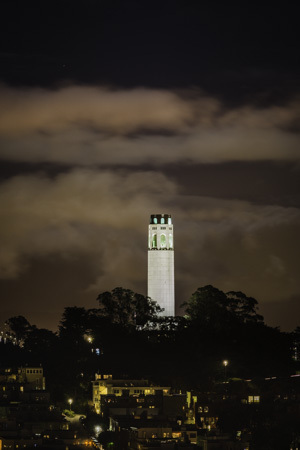 And it too stands as a beacon in the north bay. Clouds were covering the skyline just shortly after dusk when we arrived, which is a boon to photographing in the city, as the lights below get reflected upon the skies above. 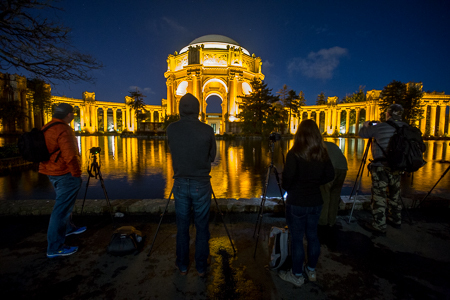 We setup in front of the massive reflecting pool and began to settle into discussing how to make the best images, without the best available light. 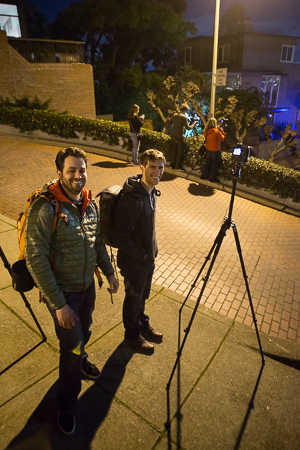 Tripods and cable releases are paramount to steady, blur-free photos. We helped the group to achieve their goals of capturing this golden monstrosity complete with reflection on this still night. Our next stop was up to Lombard street. The switchbacks of Lombard have been made famous the world over. Its a narrow winding path down the hill which thousands of cars travel everyday. And at night, the action doesn't stop. 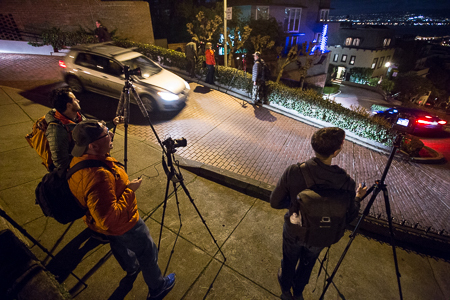 With our cameras setup we patiently waited for the throngs of tourists to drive down the hill and into our frames. What were we looking for? There's the magic. 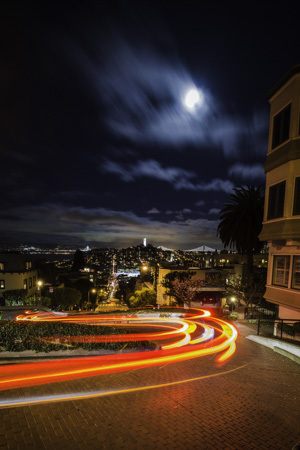 We weren't photographing the cars coming down the street, we were trying to pick up what they left behind; light trails. Every car travelling down the hill leaves a streak of illumination in the direction of their travel, a ghosting of light perfectly carved through our photos like magic! After we shot the curvy street looking down the hill, we walked to the next lower switchback, and pointed upward, to gain a different perspective. Both unique looking, but creatively different. After an hour or so of playing around with the cars and streets, it was time to pack up and head out. Next on the list was a definitive classic. The Bay Bridge. 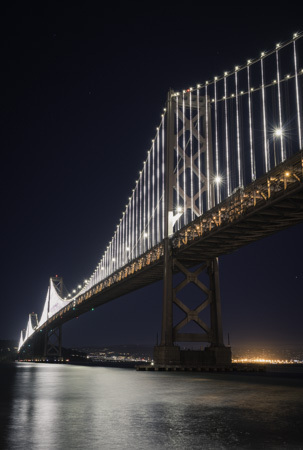 Ever since the LED installation, the Bay Bridge has been getting far more attention, and rightly so, the western section of the bridge is beautifully adorned with tons of lights, illuminating the span cables in a brilliant white light that can be seen for miles. 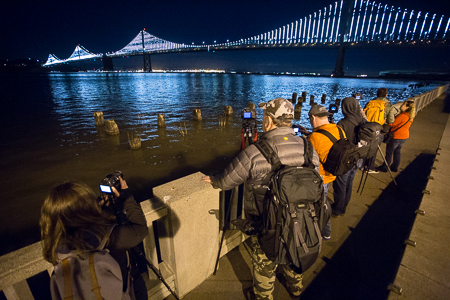 This particular spot is famous too, for the old pier pilings in the water just off the Embarcadero, provide photographers with a much needed foreground to help balance the magnificence of the lighted bridge. 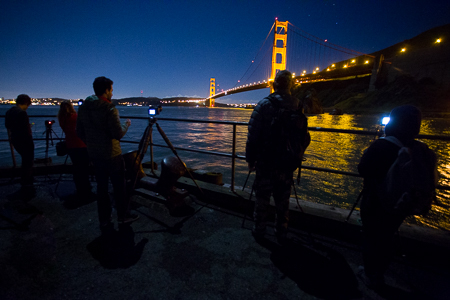 We were doing so well on time, that even walked southward along the waterfront to catch a different glimpse of the bridge from a much closer vantage point, enabling us to shoot vertically. Once everyone had their fill, we doubled back across the Golden Gate for one last bonus stop. Fort Baker is one of many military installations the provided security and deterrence for the bay. But now it boasts one of the best vantage points of the Golden Gate bridge. The fishing pier gives a great look at the southern side of the bridge from a lower perspective, allowing us to once again use the water to help bring out the reflection of the golden lights which adorn the roadway. 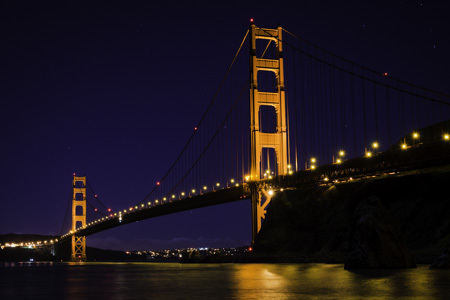 At this point in the night, the moon had risen high enough that the entire skyline was bathed in a dim surreal blue, which helped to set the bridge apart from an otherwise clear dark sky. Our group also switched gears and shot toward the city, as the pier provides an unobstructed view of the downtown area. After a while, the cold and the night set in, and our time was up. 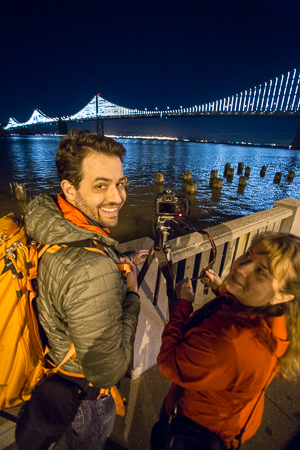 We drove our awesome group back to the confines of Sausalito and parted ways, but with some seriously fabulous shots of the golden city by the bay.